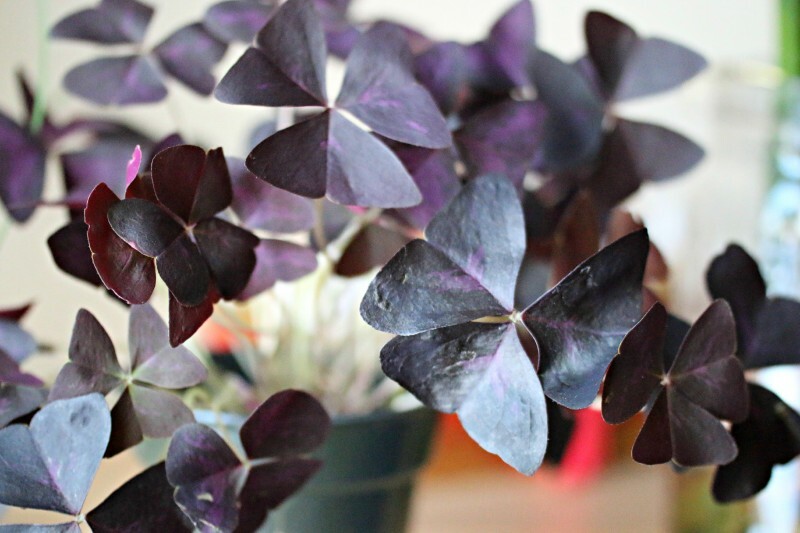 I am in love… with my purple shamrock, of course. I just can’t get enough of it. I first laid eyes on this plant last summer at a doctor’s office. They looked like little butterflies on a stalk, and didn’t think they were real. I moved closer and felt their leaves. They were real! Almost immediately I knew I had to have it. I had been searching for a while and actually gave up on finding one. They are quite rare to find in garden centres, at least in Ottawa. I finally located one at Flowers Talk/Tivoli. If any of you live in Ottawa, you should definitely check out that store. I discovered it late last year and I couldn’t believe my eyes. It was Plant Lover Heaven. They stock my kind of plants and I always have to show restraint when I’m there. Ok, back to the plant. 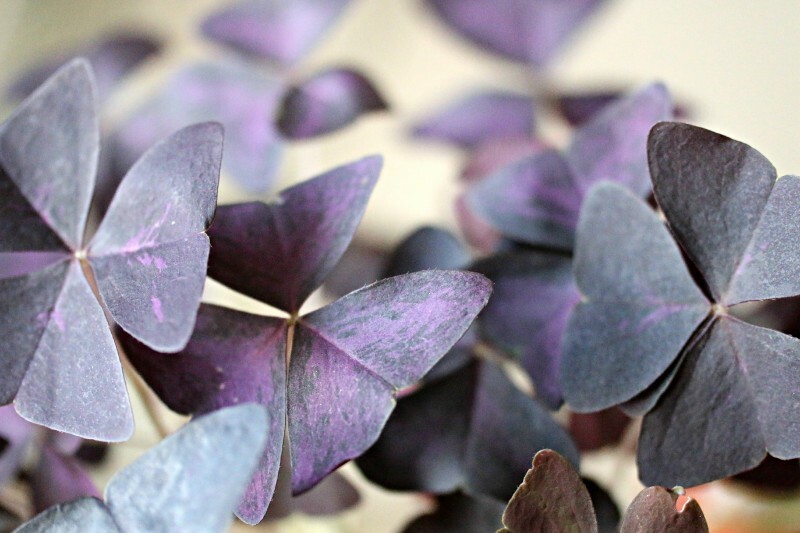 It’s called Oxalis triangularis aka purple shamrock, false shamrock or love plant. I call her Shirley. Her leaves come in threes with a triangular shape. 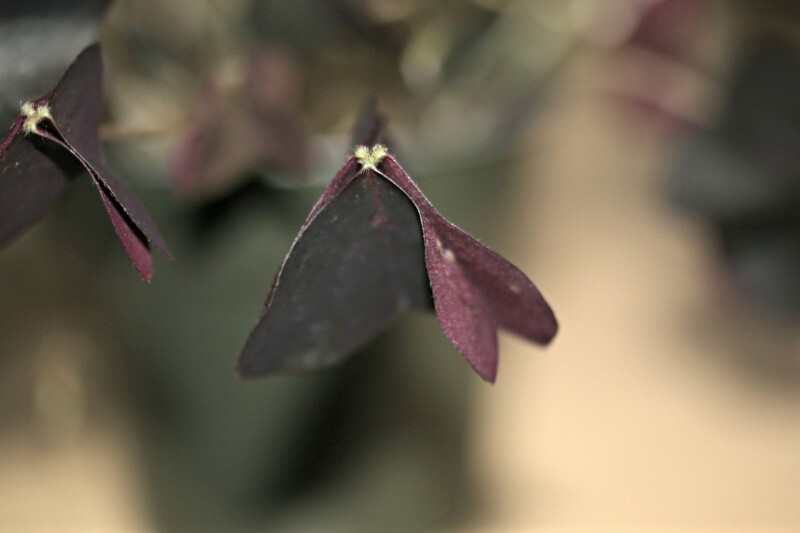 Some people say the leaves are shaped like hearts but I think they look more like wings on a butterfly than hearts. Is it just me? 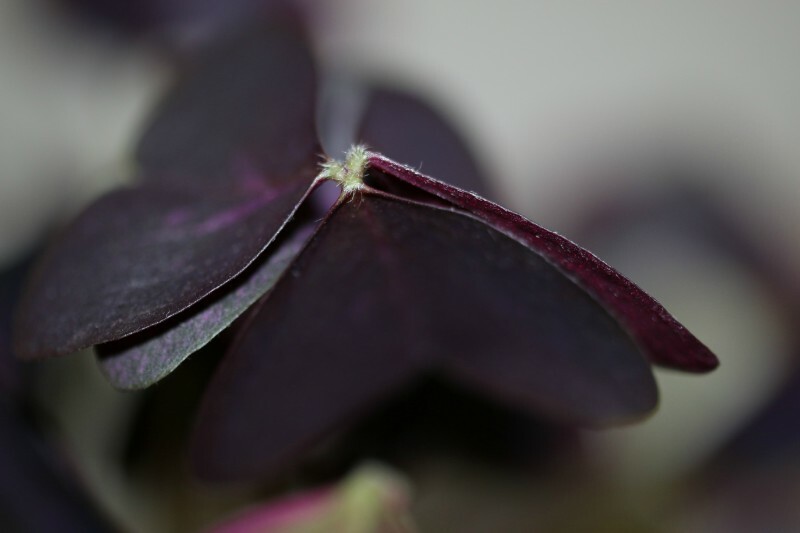 Most plants with colour need a lot of light to maintain and do not do well indoors with low light, but the Oxalis is perfect because it can thrive and keep its colour even in a north facing window. Apparently, they actually do better in low light than their green counterparts. Can you tell how excited I am to have this plant? They like well draining soil and not particular about humidity. They grow from bulbs or rhizomes and can be easily divided at time of re-potting. They will apparently die back if conditions are not favourable but will quickly grow back when you give them the right conditions. They also go into dormancy like any bulbous plant after the spring/summer or growing season. They also bloom white flowers with a tint of pink and purple. Mine had about 1 or 2 almost dying flowers which I removed. I must confess I’m not much of a flower person, unless they are on succulents (those flowers are always interesting). I am all about the foliage. I was surprised to find the leaves on Shirley closed once I brought her home and took her out of the bag. They respond to touch by folding their leaves, but not as fast as the tickle plant or Benji, my Venus Fly Trap. Watch Benji in action here. Shirley’s leaves also close at night, like Princess, the prayer plant. Pretty neat! 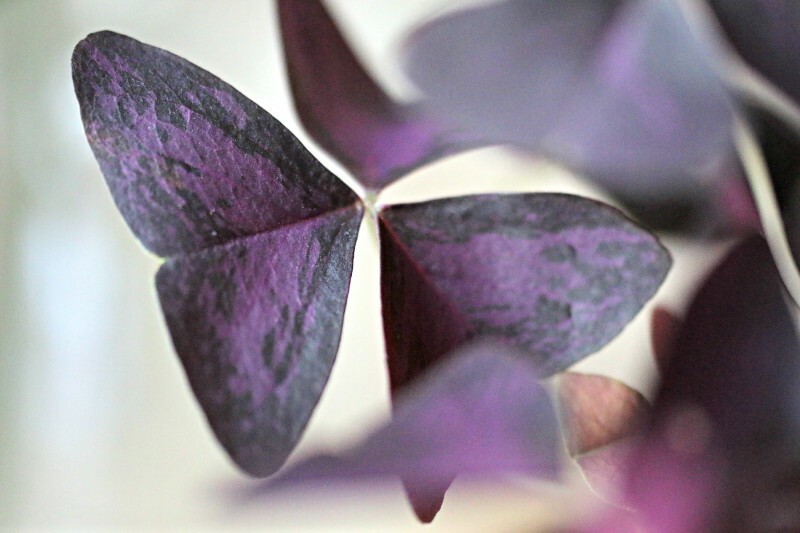 I love love love my purple shamrock plant. They are so beautiful. It adds a nice touch of colour to any room. Do you have a purple shamrock? Have to love them! I bought 6 corms (the small bulbs) 22 yrs ago. Now I have many of them, they are planted in a flower bed to shade the roots of my Clematis also I plant them in the large pots around my banana trees, rubber trees, ficus, Calla lilies, etc. Anything that grows taller than the oxalis as long as the colors don’t clash. Sometimes when they start growing again after their winter rest they come up with rust on the leaves. I just give them a hair cut with scissors then pick up the cuttings and trash them. In a few days they come back up and look great. Yes, I’ve had a couple of these over the last few years. It is outdoors in a pot in the summer (blooms its little head off) and comes in for the winter. Quite the resilient little thing. I enjoy it. Glad I piqued your interest in them again Krista! I love this plant too and have been eyeing it off online for some time now. I think it’s time to get one – you’ve sparked my interest again Barbara! Glad I could help 🙂 I love it so much I ‘m actually planning on getting the green one too.